Earlier this year, we went to the Okavango Delta, Savuti and the Chobe Reserve in Botswana. 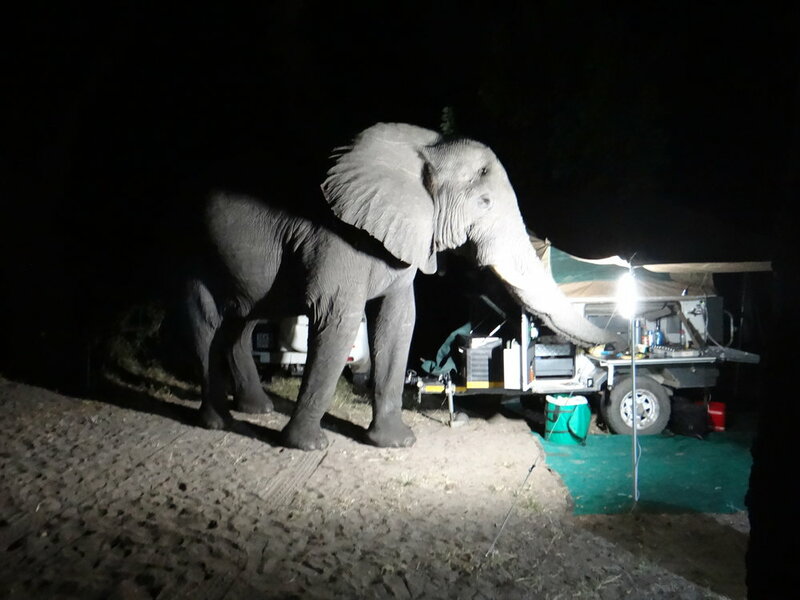 (read about this on our earlier blog – Botswana Safari). Amongst our group was my son Chris, his wife Michelle and their son Liam who is 8 years old. The Okavango, Savuti, Chobe holiday offers a spread of forest, water and semi-arid conditions with rich bird and animal sightings. On discussing the holiday with Liam, Michelle reports that “Liam enjoyed seeing the leopard and the big five. He learned about all kinds of birds, but it wasn’t his favourite thing to do. He loved being the only child and spending time with the adults in the group. One of his favourite experiences was when the elephant appeared during our dinnertime and sniffed around Andrew’s kitchen. He found the driving very long, but it was ok”. A few weeks ago, we went with another group of 7 families to the Central Kalahari. This time our daughter Liesel, her husband Ryan and their 5 year old daughter Hannah were part of the happy throng. The Central Kalahari is semi-arid and quite harsh. Birds and animals aren’t as plentiful and I wondered how a young child would cope in this environment. We have to be self- sufficient with water, food and fuel and all trash has to be taken with you when you leave the area. Hannah reports: “My favourite part about visiting the Central Kalahari was looking at birds. My favourite bird was the glossy starling because its bright blue and has lovely orange eyes. I loved feeding the hornbills – their names are Billy and Milly. I also loved giving the birds their water. I love the bush and I am so excited to be going to the Chobe next year.” Hannah has said that she would be delighted if the birthday fairy or Father Christmas would bring her a bird book that has “a magic wand” that you stroke across the pictures – so that you can identify the bird and its call. Hannah announced whilst in the Kalahari that she didn’t want to go home. When I suggested bush school, she was thrilled about the idea! I had been confident about taking the eight year old, but was somewhat hesitant about the 5 year old camping in the harsh and wild Central Kalahari. Firstly, it must be said that there is a huge responsibility in taking children into wild areas. Children need to be obedient and constantly aware of their surroundings. They must also remain close to and within eye shot of adults at all times! Both children benefited significantly from their experiences. Connecting with Nature is priceless! 2. Breathing in fresh, unpolluted air; drinking water and eating simple freshly produced meals. 3. Experiencing spectacular sunrises and sunsets. 4. Learning to carry out basic chores with joy. 6. Stimulates an interest in learning about flora and fauna in a fun way. 7. Creates a deep appreciation and love for, and connection to, the natural kingdom. 8. Kick-starts learning which spills over into an awareness of nature in their own urban neighbourhoods. 9. Encourages verbal interaction with other people of all ages eg around the fire at night, sharing their experiences of the day. 10. These holidays provide a wonderful ‘bush school syllabus’ that is fun and exciting –positively expanding young minds. Southern Africa offers so many opportunities for wonderful, natural experiences for children and adults alike.